It's not exactly soup weather in Southern California, but when did we ever let weather stop us from anything? It's Soup Swap time again. I've hosted two soup swaps at my house over the past few years, the first small and informal, the second too big to handle (for me). This year I'm doing my part in a slightly different way: I'm joining a team and swapping with five other teams for fun and prizes at the Sunday Long Beach Farmer's Market. Kelli organized this one, of course. She's good like that. What to make? A brief pow-wow with teammate Audge brought up the idea of colors. Red soups, green soups, yellow soups. Which makes me think of my infamous rosemary red soup with alien heads. 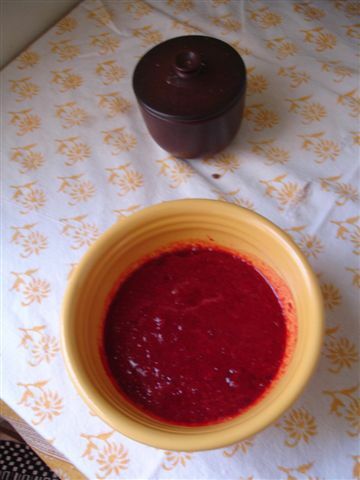 A great, deep red color, provided you use the correct color of beet. And something orange. With carrots. There's a bounty of carrots out there right now. Best to help use them up.